Got an itchy green thumb for an organic garden but not the space to support it? 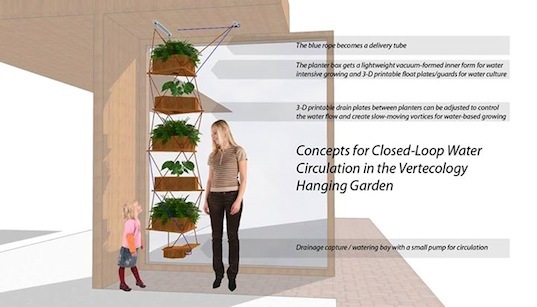 Introducing the Vertocology Hanging Garden, a vertical structure created by Eugene-based Mark Scott Lavin that’s perfect for urban dwellers. Inspired by the designs of Buckminster Fuller, the Vertecology Hanging Garden was created with a stable geometric form that makes the structure strong, wind-resistant, and easy-to-build. While the space-saving garden system is already available for purchase, supporting the Kickstarter would help fund improvements in the design, such as making the Vertecology Hanging Garden flat-packable and into a self-contained ecosystem able to support soil, aquaponic, and hydroponic growing. Got an itchy green thumb for an organic garden but not the space to support it? Introducing the Vertocology Hanging Garden, a vertical structure created by Eugene-based Mark Scott Lavin that's perfect for urban dwellers. Inspired by the designs of Buckminster Fuller, the Vertecology Hanging Garden was created with a stable geometric form that makes the structure strong, wind-resistant, and easy-to-build. While the space-saving garden system is already available for purchase, supporting the Kickstarter would help fund improvements in the design, such as making the Vertecology Hanging Garden flat-packable and into a self-contained ecosystem able to support soil, aquaponic, and hydroponic growing.